Image caption President Rousseff said that large engineering projects "always go down to the wire"
Brazilian President Dilma Rousseff has defended the way her country has organised the football World Cup, which kicks off next week in Sao Paulo. She insisted it would be a resounding success, despite criticism about late stadiums and infrastructure delays. She told reporters these kinds of problems were common everywhere. Ms Rousseff, who faces the possibility of fresh anti-government protests, said they would not be allowed to disrupt the tournament. "Everywhere in the world these big engineering projects always go down to the wire," Ms Rousseff told a group of foreign reporters at the presidential residence in Brasilia. "Nobody does a (subway) in two years. Well, maybe China," she said about delays in infrastructure projects which have riled many Brazilians who were expecting to benefit from upgrades planned for the World Cup. Urban transport systems in Cuiaba, Salvador, Recife and many other cities have not been finished as all efforts went into completing work on football stadiums for the tournament. The president called the delays "the cost of our democracy". Referring to recent anti-World Cup protests - some of which descended into violence - the president said that while demonstrations were part and parcel of democracy, thousands of extra police and soldiers would ensure that they did not mar the World Cup. "We fully guarantee people's security," she said. More than a million people took to the streets last year during the Confederations Cup to protest against corruption and what they consider to be excessive spending on the preparations for the World Cup. The protests, which originally started as relatively small gatherings of people opposing fare rises on public transport, grew after the police used heavy handed tactics to disperse the demonstrators. Ms Rousseff said the response of the security forces would be closely watched this time around. On Tuesday a small group of anti-government protesters targeted a friendly football match between Brazil and Panama in the central city of Goiania. The demonstrators, who gathered near the stadium, denounced the huge cost of the tournament, arguing that more money should be spent on public services to ease inequality. 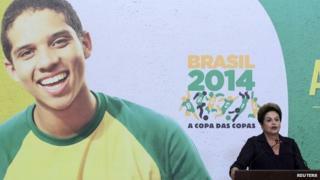 The tournament will start on 12 June with the hosts Brazil playing Croatia in Sao Paulo.